The year was 1898 and army private Patrick Henry Frank was in New Orleans awaiting transport to Cuba to fight in the Spanish-American War. A change in orders and Private Frank was instead going to the Philippines. Admiral Dewey had stunningly defeated the Spanish navy at Manila Bay, but President McKinley wanted boots on the ground. Patrick Henry Frank's country was seeking its manifest destiny further west than America had ever moved. 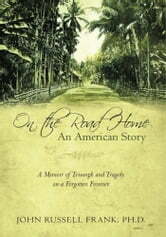 Through a riveting narrative history, author John Russell Frank chronicles the events of his family's half-century on America's frontier in the Philippineswar, adventure, colonialism, the heartbreaking deaths of family members, businesses ravaged by WW II, and internment in brutal Japanese prison camps. It is an epic story about his familys triumph and tragedy in a strange land, a story of how they came to absorb and become a part of another culture. The narrative flows from a substantial amount of intimate archival material: historically rich letters, war diaries, photographs, memoirs, and oral and video histories from the familys experiences in the Philippines. He shares a way of life and a time-period unknown or forgotten by the present generationpivotal years of America's past. In the process, the author discovers his own roots.